This tour operator has two pirate ships: The Marigalante and the Jolly Roger (capacity 200). The Marigalante is made completely of wood and is an exact replica of the famous Santa Maria ship from Christopher Columbus’ maiden voyage to The New World. With four decks the Marigalante ship has a capacity for 220 passengers. In addition to a fully-equipped modern kitchen and a huge dining room, amenities on this ship include 2 bars, a professional sound system, 8 kayaks, 2 inflatable banana boats, boogie boards, life jackets, snorkel fins and masks, lounge chairs for the daytime tour and rustic benches for their evening sail. The daytime tour and activities are more appropriate for families with young children. 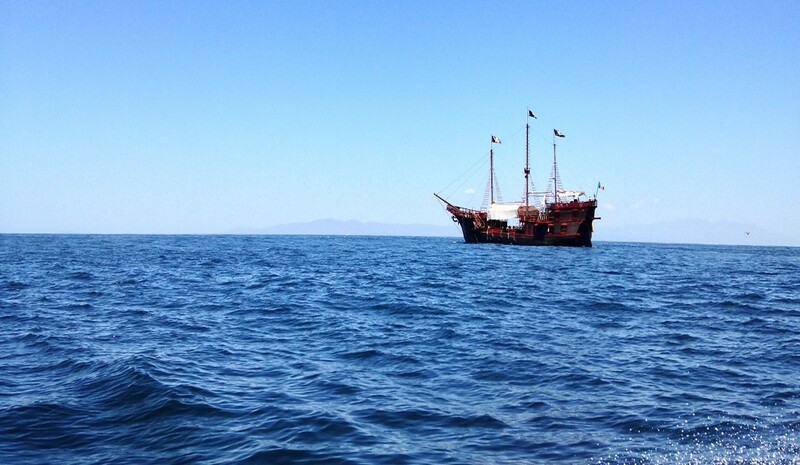 Days/Time: Monday – Saturday at 9:30 a.m.
Great family fun aboard a real pirate ship in Puerto Vallarta, Mexico. Ticket Price Includes: Breakfast, lunch and open bar. This all-day cruise aboard a real pirate ship features a pirate show, cannon blasts, acrobats, sword fighting, music, dancing, games, contests, buried treasure hunts, beach volleyball, water sports to include kayaking, banana boat rides, and snorkeling. Cruise includes a 2-hour stay at Majahuitas Ecological Reserve or at Las Cargadas (a secluded beach only accessible by boat). Discounted tickets are normally available when booking online directly through the tour operator. Days/Time: Monday, Wednesday and Friday at 7 p.m. Ticket Price Includes: Sunset cruise, pirate show, acrobatics, sword fighting, fireworks, dinner (choice of four entrees with vegetarian options), open bar, music, dancing, and audience-participation contests. Special promotional pricing is often available for online bookings made directly through the tour operator.